Frances Louise Welch, age 89, resident of Arlington, Tennessee, died November 4, 2018. A Graveside Service for Mrs. Welch was held at 2 P.M. Tuesday, November 6, 2018 at the Memphis Memory Gardens Cemetery with Bro. Rickey Burns, pastor at Williston Baptist Church, officiating. Arrangements were provided by Peebles Fayette County Funeral Homes & Cremation Center – Main Chapel of Somerville. Mrs. Welch was born September 6, 1929 in Cherry Valley, Arkansas. She was employed at Southern Central Paper Company for 30 years and was an excellent caretaker for so many. She loved spending time with her children, grandchildren, great-grandchildren and special times with all her family and friends. She will be remembered for being a wonderful, loving and caring person that will never be forgotten and could never be replaced. 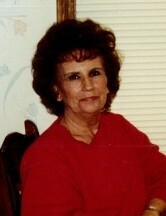 Mrs. Welch is survived by her daughter, Sandra Welch of Arlington, TN; two sons, David Welch of Arlington, TN, James Welch and his wife, Deborah of Arlington, TN; her sister, Quida Lessel and her husband, Bobby of Bartlett, TN; six grandchildren, nine great grandchildren and a host of extended family members and friends. She was preceded in death by her husband, James L. Welch Jr.; her parents, Russell and Emma L. Murphy; two sons, Terry Welch, Sr., Rickey Welch; two brothers, Virgil Murphy, Wayne Murphy; her grandson, Terry Welch, Jr.; and her great-grandson, Terry Welch III.